Hey guys I know its been a bit since my last post, but I’m finishing up my last semester in school for my undergraduate so that’s taken most of my available free time. But anyway I’ve managed to find some time and decided to go to the De-la-warr Open located in, well Delaware! So you’d probably expect me to say something along the lines of “oh woes is me, which Wraithknight should I take to this event?!?!? !” Well, lets be real it is a pressing matter for most Eldar players. But fortunately for you I’m not taking Council to this event so you don’t have to hear my lamenting about my Gargantuan Creature choice! First off if you’re interested in going, more information can be found on their website located here. But it appears, at the time of this writing, their website is down. So here’s a Google Cache version of their front page. It is NOVA Format so this will be a great chance to test out those NOVA Lists! This is going to be my first time going to Delawarr so I’m pretty excited. Now onto the list I’m bringing. With the American Team Championships looming I’ve decided to bring the list I plan on bringing for that. 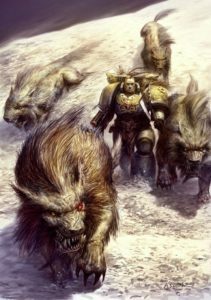 Since my team already has great gladius and Eldar players on it, that regulates me to my Dark Angels and Space Wolves. So with that in mind I’m bringing a Barkstar list. What is Barkstar you ask? Its essentially a ton of Fenrisian Wolves in the Wolfkin formation. You can see my list by clicking here. Because I don’t have access to Space Marines in the ATC format that’s why I’m going with the Dark Angels Conclave. My concern is after talking to other people planning on playing Barkstar lists is, I might not have enough dogs. Which makes me think, do I want to up it to 75? But then I’d have to get 75 dogs, I’ve already got 20 painted up (I’m borrowing the other 25 from a friend for this weekend) and my Painter already has 40 Dogs that I’ve given her. So I guess what’s an extra 15? But, I’m not sure I even want to own 75 dogs. For right now this point is moot since I don’t actually have that many Dogs to take with me this weekend. But it is something I have to think about. Now my plan for this list is pretty straight forward, buff and run at my enemy. Even with the new Space Marine powers I think my priority for powers against non Imperial Knight lists is Invisibility -> Marine Fortune -> Sanctuary. I only have 9 rolls so getting all 3 of those might be tough. And while I do have a ML3 Librarian, Ezekiel doesn’t get cool re-roll abilities like Tiggy, but it will help. If I do end up facing any Imperial Knights I’m pretty sure its going to be Furious Charge Warlord Trait (Azrael picking a trait is AMAZING) Misfortune -> Invisibility -> Hammer Hand. Hopefully at ATC I won’t have to play Imperial Knights as the list will struggle against them, but I don’t get that luxury at Delawarr. I just hope I dodge them. Now this will be the first time I’m playing this list, so it’ll be interesting and because of that I don’t think I’ll do that well there. My goal is to go 3 and 3, which I probably can. This weekend is more of a test of the list. 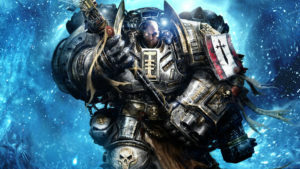 Because another option is adding in Grey Knights for Stern who automatically comes with Hammer Hand and Sanctuary I believe. I can also throw in a ML3 GK Librarian to help fish for powers. The problem is I don’t get access to 3+ power casting. Ahh Super Friend predicaments. Regardless this is going to be a fun weekend with getting 6 games of 40k in for testing purposes and hanging out with 40k friends! If you plan on going find me and say hello!